The name of the web service is shown here. Displays the path in the WSDL structure of the web service. Opens a dialog where the web service can be registered. Opens a dialog where an operation can be selected. Intrexx authentication. The intrexxLogin operation is used for this. Integrated Windows authentication. The login operation must be used here. The actual web service operations can only be requested after this. In closing, the logout operation needs to be used so that the session is ended correctly. Opens a dialog where the construction of the web service is represented. The arrow buttons allow the priority to be changed when multiple requests are defined. Multiple web services will be executed one after another in sequence. The uppermost call will be started first; afterwards, all requests below it will follow in order. Here, the structure of the operation from the request web service is depicted. Select the method that should provide a value from the application. Opens a dialog, where the source of the value can be defined. 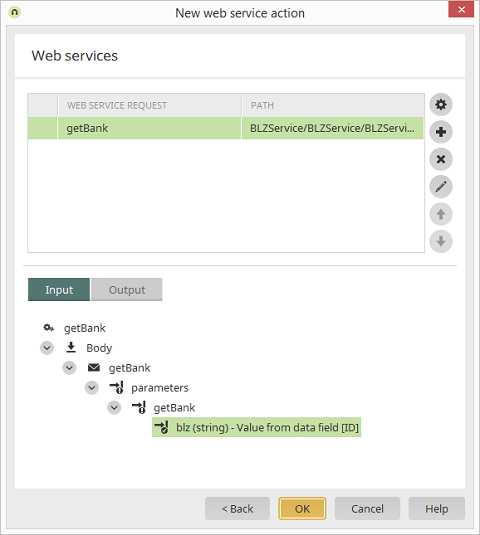 The data type that the web service expects is shown in brackets next to the method (e.g. blz (string)). Here, the value received from the web service can be assigned to an application element.